Walsine Pierce: GOTTA FRIEND? Be A Friend! "Were there not ten cleansed? But where are the nine? ﻿Don and Sally Wilson, beside Julie and I in the above picture, are the dearest of friends. To put it bluntly, we have been down the road together, letting the good times roll. They were the lead square dancers in my SOGGY BOTTOM BUNCH, JUG BAND, SINGERS AND DANCERS. Sally also played the spoons and the accordion and Don played a jews harp. They are truly quality people with whom we have enjoyed the good life. Don fishes. No, I like to fish, Don fishes. He has fished Lake Erie for walleye and perch for decades. He catches fish. He catches more fish than he and his wife could possibly eat. On a regular basis Don gives Julie and I fifteen or twenty pounds of walleye and perch filets. Unlike the filets you see in the store for $9.99 a pound with the skins on the filets, Don's filets are boneless and skinless. Perfect! 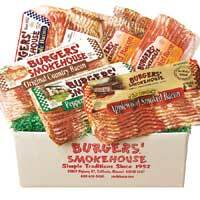 Burger's Smokehouse is a catalog store in Missouri that sells smoked country hams and bacon. You can get a wide assortment of﻿ the highest quality meat and treats from this outstanding establishment. Anything from game birds to buffalo steaks. Over the years they have provided me with smoked meats for wilderness expeditions away from refridgeration. Not wanting to be like the nine healed lepers who failed to express thanks, Julie and I ordered the above bacon sampler for Don and Sally thanking them for the fish, vegetables, vension and, most of all, for their fellowship. When they arrived at our house last Saturday evening for the 2012 Progressive Dinner of our dining group, they started thanking me before they even got on the porch. I reminded them that what we gave to them was but a trifle compared to what they gave to us. Don repeated what we had written on the enclosed card, especially the part about the fellowship. We also included two smoked chicken breasts. Don said they took the delivery in the house, opened it and made themselves a Canadian bacon sandwich. Made me feel good! Have you thanked them lately? It will make you feel good, too! Not sure how to thank them? Go on line to http://www.smokehouse.com/ ﻿or call 1-800-345-5185 and talk to the good folks at Smokehouse Meats. While ordering something for your friends, order yourself a treat. You'll be twice blessed.